Luca and Laura, a young and very in love couple, have celebrated their wedding in Bologna, choosing as the venue for this special day the Red Hall of the Municipality. In this elegant setting, they have gathered close family and friends, making the ceremony a very intimate and personal moment, but, just because they are surrounded only by the dearest people, also full of joy and emotion. Immortalarli sorridenti con lo sfondo delle bellissime tappezzerie rosse della Sala e, in compagnia di un simpatico palloncino a forma di cuore fucsia, fra le stradine e i monumenti della città è stato molto bello, ma siamo stati ancora più felici quando abbiamo scoperto che il matrimonio a Bologna non sarebbe stata la fine delle loro celebrazioni. 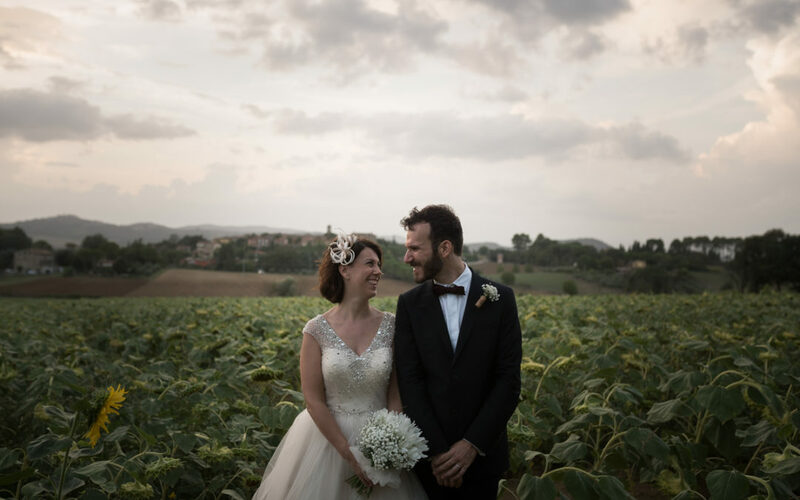 Since the first day had missed a real party, in fact, Luca and Laura have that during the weekend would have filled this lack, moving to Umbria (in particular in the hills of the province of Perugia) for a romantic American ceremony, always accompanied by family and close friends. The one they chose was certainly a very suggestive location: a farmhouse in the hills surrounded by sunflower fields, olive trees and vineyards, in an atmosphere that combined the rustic and the elegant in a unique way. The theme of this American ceremony was wine, a great passion shared by Luca and Laura, a choice that has been declined in many small and great details of the exhibition. From the tables named according to various types of wine to the choice of using a crystal champagne glass as a wedding favor, the theme of the wine was also taken up with the imaginative use of corks, which formed the tableau, numerous decorations and even the groom’s boutinnière (a truly classy detail, in our opinion!). Within such a setting and with a close-knit couple like Luca and Laura, finding opportunities to take pictures was easy: the fields of sunflowers, the background of the Umbrian hills, the details of this elegant and rich American ceremony details that recall the theme of wine, all aspects that we tried to capture at best and harmonize with the cheerful and elegant style of this couple. Passing these two special days with them was really a pleasure, thanks to their welcoming way we really felt at home!